Our ISO consultancy company is offering quality management system implementation services for ISO 15189 accreditation in medical laboratories. So far many companies globally have taken our services to successfully develop own quality management system. Our team of experienced ISO 15189 consultants guides medical laboratories in system implementation, documentation and training process, which helps in quick implementation of effective quality management system, and hence, quick ISO 15189:2012 certification. Our QMS consultants help in developing and establishing a management system that facilitates compliance to the requirements of customers and-pre-eminently-various global regulators. Our company is introducing ISO 15189:2012 Documentation Kit for medical laboratory accreditation, which can be used as a ready-reference tool to complete documentation process. This readymade documentation kit for medical lab's quality management system - ISO 15189 certification helps in accreditation and also in meeting customer requirements. 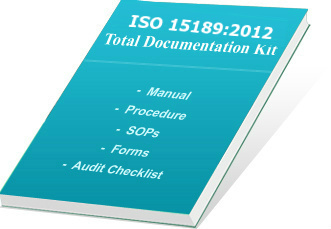 During preparation of ISO 15189 documentation, - companies prepare manual, procedures, SOPs, exhibits and forms to establish a good working system. Our experienced team of consultants have designed quality documents to help organizations and consultants to establish effective documentation. Sample quality manual (01 editable word document). Standard Operating Procedures to follow while implementing quality system (30 SOPs). Set of formats and templates for maintaining records (94 sample forms). Exhibits to add effectiveness in system implementation (06 editable files). Audit Checklist (more than 350 questions)- to verify implemented quality management system for medical lab accreditation. The entire QMS 15189 documentation kit is written in simple English and provided in editable .doc format, so that just with minimal editing your documents will be ready. The total documents for QMS with easy editing features and compatible with system requirements can be purchased from us. Our documentation kit is a very effective tool to learn and implement QMS documentation completely and meet the demands of the updated system requirements. It helps medical laboratories in implementing ISO 15189 system and getting benefits of certification in day to day operations. Users can easily amend and change the templates as per their working system and create their own quality documents quickly. Saves much time and cost in document preparation. It gives 100% value for money to customers. Documents are useful in training staff on QMS requirements. THis kit takes care for all the sections and sub-sections, which gives better confidence and improves the system. Effective tool to create manual, procedures, records and audit checklists for quick certification. On successful completion of payment process, we provide username and password to download the product from our FTP server. The delivery of our products will be within 12 to 24 hours of payment confirmation.